This Burger King in Baldwin Park participated in the 88-cent Whopper day today, Aug. 8 or 8/8. The line for the drive-thru was not the only thing that wrapped around the building. Inside, the line of diners looking for a lunch deal snaked from the front of the restaurant down the back dining area and nearly out the door. I was sitting there, checking my phone, noticing how the Dow (stock market) was dropping by 500 points and thinking, is this a sign of the times? 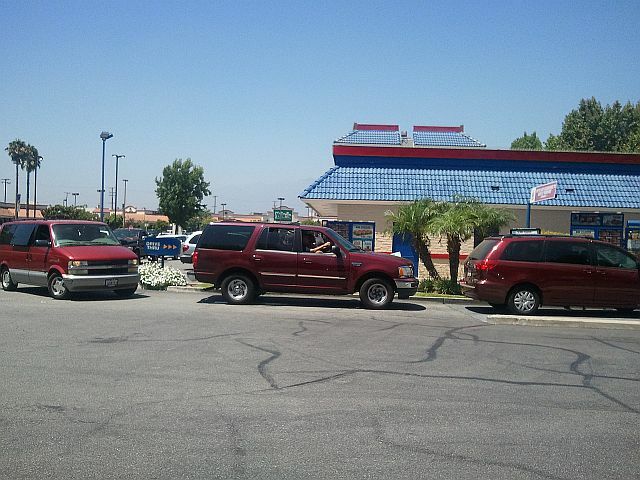 The Burger King off San Bernardino Road in unincorporated Covina also had a line of cars out of the parking lot. The 88-cent promotion and the Wall Street drop on the same day? I don’t think BK planned it that way. But in today’s economic climate, everyone is looking for a deal.